Sponsoring numerous events each year at 13 different parks that span Southeast Michigan, Oakland County Parks and Recreation needed something that would attract attention, mark their event sites and draw in more traffic. What could be a more perfect fit than an inflatable archway? To date, the giant green and blue arch has made appearances at the Doggy Dash and Pet Expo, Brooksie Way Fun Run, Hidden Forest Run and the annual Pumpkin Launch. 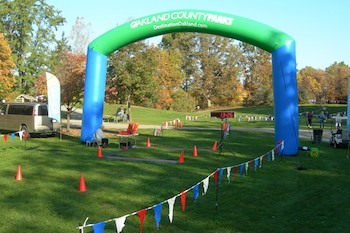 Each event greeted visitors with the new inflatable archway customized with the department's name and web address. During 2012, the arch will be used to elevate awareness and generate brand and name recognition for the city and/or event being promoted. In their employee newsletter, Mike Boyd, Oaks and Orion Oaks Park Supervisor, announced the new inflatable arch with an example of its effectiveness. "With the inflatable archway, you can't miss the park. It helps with visibility. I had a couple people pull into the park during an event and ask, 'What's all this about?'" With an inflation time of less than one minute and ease of transportation from one event to the next, Oakland County Parks and Recreation has found a quick, simple and obviously effective way to meet its marketing goals.